When compiling, the two "<" characters get replaced by a single "opening french quote" character (sorry, don't know its name). Is there a way to avoid this behaviour (besides using math mode) ? Is there a way to tell Latex NOT to do these automatic character replacements? 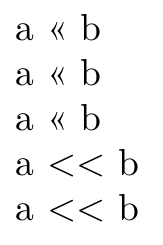 Edit2: Use case: I am putting up some course text documents on OSes, and appending to a file gets written a >> b.
because LuaTeX ignores braces when doing ligatures. When somebody will tell you that some negative kerning must be applied between the less than symbols, you'll be happy of having preferred an abstract method. Side note: this assumes the OT1 encoding is not used; with it the input << would not produce a ligature, but ¡¡ (two reverse exclamation marks); the ligature << for a left guillemet is only active in the T1 encoding (and possibly LY1) and, with fontspec and (Xe|Lua)LaTeX, for fonts loaded with the Ligatures=TeX option. how to automatic mathbold all capital letters?